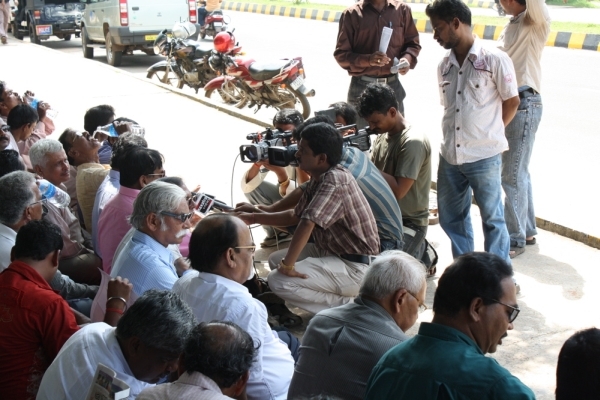 Sept. 22, 2010: The Police did not allow the Media Unity for Freedom of Press (MUFP) to hold its silent demonstration in protest against atrocities perpetrated on media persons in Orissa , as declared earlier, in front of the Governor’s House (Raj Bhawan) on September 22. Equipped with misuseable powers, it rather forced MUFP to offer its demonstration in a quite disadvantageous roadside near the Circuit House, in the Raj Bhawan locality. 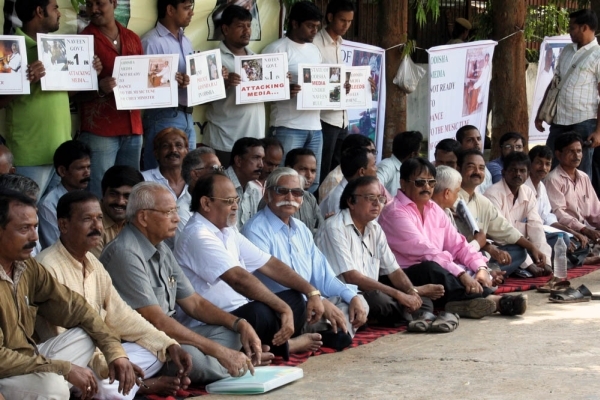 Yet, hundreds of media persons belonging to print, electronic and web media joined the silent demonstration of protest to condemn the silence of the State Government over repeated attacks on the media in the State. A large number of intellectuals, educationists, advocates, social and political activists expressed their solidarity with media by joined the protest. Talking to the newsmen, Prasanta Patnaik, member of the Presidium of MUFP said that since repeated appeals to the Chief Minister to stop Police from implicating media persons in false cases and to stop State sponsored / mafia attacks on media persons yielded no result, it has been decided to urge upon the Governor to intervene. Condemning the manner in which Bikas Swain, the printer, publisher and promoter of Oriya daily Suryaprava was arrested, Patnaik said that Swain was not a terrorist or a dreaded criminal with records of escaping the law. Yet the plain clothed police intercepted his vehicle, when he was on way to a hospital carrying food and medicine for his father who is struggling with cancer. According to reports, the policemen snatched away the food and medicines and threw it on the road. On the basis of a F.I.R. vitiated with fluctuating statements by the complainant, the police have slapped harsher criminal charges against him, that shows how much the police is motivated against him, he said. He further said that the police have blatantly violated the procedures prescribed by the Supreme Court of India, National Police Commission and Article 21 of the Constitution of India in connection with arrest of any individual. Suryaprava managing editor, Naveen Das informed about the motivated design of the police against the paper for exposing wrong doings of the Government. He disclosed that about a fortnight ago a senior police officer had indicated to the Editor of Suryaprava that it may face consequences for writing against the police and the Government. Since the Governor was on tour to Bangalore, it was decided to handover the memorandum to him on his return.